"I'm left with the sort of conclusion that you'd expect of someone reared in the watershed of the Great Lakes: If you don't have enough water where you are, you shouldn't be there. There's just too many people living in the desert." "LA is right on the ocean. Silicon Valley is home to some of the smartest people on the planet. Surely there is a cheap, efficient solution to desalination that someone in Silicon Valley can figure out." "More thoughtful writing about our nation's infrastructure needs is a good thing. Big water projects are just incredible in their scope and complexity." "Now, and to complete the overview, please write an article about the Colorado River and how its siphoning by five states is drying the Colorado River Delta." Moreno, who works for the local utility, is related to dozens of people in town. Most of them originally came up from the southwestern Mexican state of Michoacán as part of the WWII-era bracero program, and then perched for a while in Colorado before heading west. Moreno's mother arrived in Hood in 1945. She lives in a mobile home at the end of Fifth Street, which dead-ends into a farm. Across a vibrant green field sits the impressively restored Rancho Rosebud about a mile to the north, and right next to the likely location for one of the intakes. It was once the home of the most powerful man ever to live in Hood, William Johnston, a Pennsylvanian who became a state senator and two-time California delegate to the National Grange. In the desert of Riverside County, there is a slatted metal grate sunk into a hill sloping towards the manmade Lake Perris. A small door would allow a skinny maintenance man to shimmy down via a crude ladder bolted into the concrete tube. 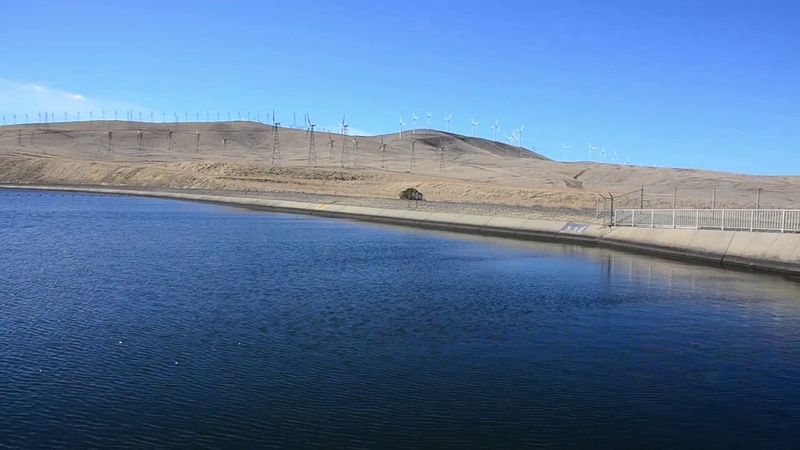 The two water projects meet up near the San Luis Reservoir, a joint state-federal facility a couple miles west of I-5 and a smidge north of the latitude of Santa Cruz. Set amidst the fractal buckling of the hills, the thick wall of the dam that holds in the weight of the water is a spectacle of flatness. It is so flat and so large as to simulate the horizon, though it’s higher and smoother, straight as a pencil line drawn sharp and fast against a ruler. It’s hard to spot the place where the Sierra water enters this desert holding tank. After driving back and forth along the lake's western edge, I ran into a state park official exiting a port-a-potty. He chewed on his soul patch for a moment. No, he didn't know, brah. But he led me back to the main office—a pre-fab building with a small porch and a large grill—and there, a man told me to drive back up the road and look for a small shed on the side of the road. “I wanted this to be a monument to me,” declared Governor Pat Brown of the State Water Project. A series of laws has tried to patch up the leaky system since then, the most important of which was the Water Commission Act of 1913, which serves as a milestone even today. Everyone who has wanted to appropriate water since 1914 has needed a permit. Those who claimed their rights before that time are considered “senior,” and they don't need anybody's stinking permit. Those are some valuable rights. A 1928 Constitutional amendment knocked the riparians down a peg, saying they couldn't claim the whole flow of a river, but rather only a “reasonable and beneficial” amount of water. Unfortunately, reasonable and beneficial are contestable terms. Basic questions remain unresolved: Does one's historical standing or land location mean anything? Or should all water flow to the highest-value uses? Jim Odom, who runs the Banks Plant, is a humble guardian of the status quo. I visited him there on the day the Department of Water Resources announced that, for the first time ever, the State Water Project would not be delivering any water to the cities or farms that pay for its survival. Scientists and analysts determined that there just wasn't enough snow in the Sierras or water in the reservoirs, the state explained, to keep the fisheries alive while sending water out of the Delta. Some water that their customers had banked would still move, but zero percent of the water they'd be allocated in a good, wet year would be sent southward. In effect, Californians were told that more than a million fewer acre-feet of water for farmers and cities would be on the move. And besides: 100 years? Most people in the Delta are looking ahead a hundred days. Financial precariousness is a perpetual crisis in places like Hood. And the state wants them to pay for more flood insurance and back a $15 billion plan to build tunnels? This is not wealthy coastal California; the per-capita income of Hood is $18,455. Sea level rise and once-a-century earthquake risks can wait. There's food to be put on the table. “If the state really thinks that the probability of that event is as high as they say when they're talking about tunnels, then the state has an economic and moral responsibility to get in there and do what needs to be done to the levee system to improve it,” he maintains. What’s more, the NRDC “portfolio” alternative would spend a billion dollars of the savings from a smaller tunnel to improve the levees in the Delta. As University of the Pacific’s Michaels said, perhaps the strangest thing about the pro-tunnel messaging is that the tunnels would do precisely nothing to protect the residents of the Delta from a horrible flood. It's hard to understand how the state can talk up the danger to the water supply a 20-island flood poses while simultaneously ignoring what such a flood would do to the people living behind the levees. Who wants to look farmers in the face and tell them that it's their land that should be fallowed? If an island was going to go, Sherman makes a poetic kind of sense. It was the first Delta land reclaimed by George Roberts, the Delta’s biggest 19th century property owner, through the Tide Land Reclamation Company after the passage of the Swamp Lands Act. Building it up was a wildly profitable business, especially with the help of the poor, stranded, desperate Chinese workers. “Reclamation” is a euphemism. The labor conditions were brutal. I ask White, the historian, what it might have been like to be in the Delta when humans began to intervene. “You'd be looking at a bunch of tule reeds, you'd be bitten by mosquitoes, and you'd have malaria,” he said. Or maybe triumphant faith in anything is an ethos for a different time. In a landscape as massive and manipulated as California’s, water issues fragment even the most potent special interest groups. Farmers might be a single, symbolic category in the state's politics, but the current water crisis doesn’t pit farms against cities, but the agricultural interests of the San Joaquin Valley against the smaller, historic farms of the Delta. Instead of a sweeping Brownian solution—a statewide water management scheme aimed at pleasing everyone—the best answer may be a collection of small fixes. “Most of my preferences can be summed up as managed retreat,” On the Public Record told me.